It’s not every day that you can put something on your calendar that says you have a meeting with someone in Afghanistan, Bhutan and Colombia. 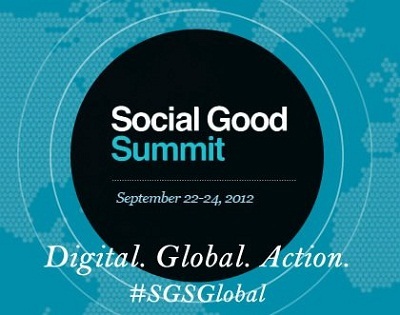 But that is what’s happening this year as part of the Social Good Summit. As I’m sure you’ve read about from our friends at Mashable, this year’s Social Good Summit will be one of the biggest global moments to talk about global issues and how technology is helping drive innovation around the big problems our world faces. This year’s event is more than just a conversation around what is happening at the United Nations in New York this September; it’s about what is happening all over the world. Thanks to meet-ups spanning the globe, and the amazing network of partners and people that Mashable, 92Y, Ericsson, the Bill and Melinda Gates Foundation and UNDP all bring to the table, this year’s event and conversation will span time zones and geographies. Bringing the realities, triumphs and challenges from hundreds of in-person conversations together, the Social Good Summit will be an amazing online moment where YOU are part of the dialogue…and the solutions. If you haven’t registered for the event in New York (September 22-24) get your tickets or accreditation now. And if you won’t be in New York to add your voice in support of those big conversations that take place during UN Week, you can get involved at your desktop, on your laptop, and in your community. It’s easy to organize a meet-up or find one that is taking place around you. We are already on track to welcome hundreds of meet-ups around this amazing global conversation. Get involved. And make sure to watch the event via live streaming. Read about who will be speaking, what issues we are taking up, and start sharing how social media is bringing our world closer together and bringing innovative solutions to global problems to the forefront. YOU are a key part of the ABC’s for Global Engagement and Social Good this year. Join us!